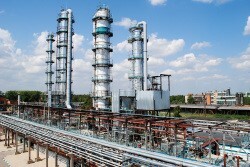 «Plastic» occupies a strong position in the Russian chemical market. The plant is situated in Uzlovaya, Tula region (200 km to Moscow). with a capacity of up to 60,000 tonnes per year, the production of expandable polystyrene with a capacity of up to 11,300 tonnes per year, as well as the production of separators and phenoplasts with a capacity of 6,380 tonnes per year. The business’s production capacity for ABS-plastics consists of about 23,000 tonnes per year, technology — Asahi Chemical, Japan. «Plastic’s» key products are ABS-plastic materials and components for automotive and machine construction; raw materials for manufacturers of plastics and the construction industry, safety products for workers in the mining and construction industries. JSC “Plastic” (Uzlovaya) is participating in international polymer exhibition Plast 2018 taking place in Milan from May 29 to June 01. The event will bring out 1,500 exhibitors and over 50,000 visitors from all over the world. “Plastic” continues its tradition of taking part in international exhibitions by bringing even wider range of ABS plastics including titles with reduced yellowness index, increased gloss and improved recycling properties. The company will also present materials of food grade and authorized for use in toy production. The company’s latest projects address such promising industries as automotive, electronics and domestic appliances production. “We are very interested in the European market, which is the focal point of Plast 2018”, — says Mr. Roman Kizimov, the Director General of the “Plastic” Trading Company, as the exhibition is drawing near. 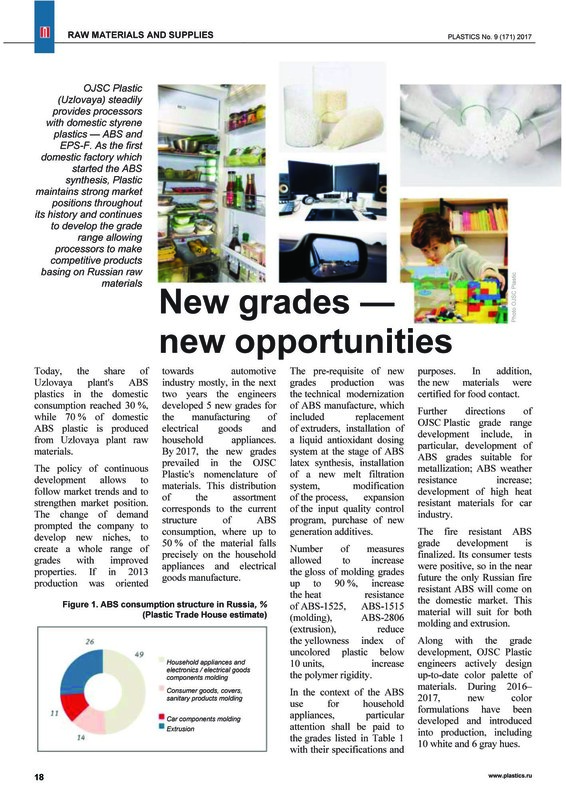 «Annual consumption of ABS in Europe exceeds 1 mln tons, with import share of 24.4%. The market shows stable growth, indicating good opportunities for increasing the supply of the Russian materials”, — stated the head of the Trading Company. In the last two years, the export list of “Plastic” expanded up to seventeen countries, including Germany, Poland, Slovenia, Serbia, Italy, Austria, China, USA, Brazil, Argentina. 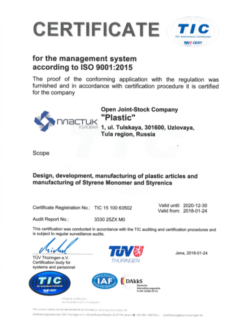 In 2018, the company acquired the Russian Exporter status and the right to mark the products with ‘Made in Russia’ symbol, which confirms the reliability of “Plastic” as a supplier and the quality of its products. The company’s interests in exhibition Plast 2018 include expanding the contacts not only with the European industrial consumers, but with specialists from other regions and continents. The upcoming exhibition will see not only the ABS plastics from “Plastic”, but makes of expandable polystyrene PSV-S with their properties improved after an upgrade as well. General public will have an opportunity to meet new product of the company, an impact strength and thermal resistance modifier for rigid PVC structures. The attendees of JSC “Plastic” at exhibition Plast 2018 will have an opportunity to talk with the sales specialists, get technical advice on using the products, and discuss a wide range of questions related to partnership. Welcome to JSC “Plastic” at exhibition Plast 2018 — Pavilion 11 Stand D31. PROTECTIVE HELMETS Protective helmets “WORKER-U”, “WORKER-M” and “MINER-M”. VACUUM FORMING PRODUCTS Interior and exterior parts of vehicles, agricultural and road-building machinery, carriages. Our ABS has wild range of usage as for industrial purposes as for manufacturing dozen types of commodities in different spheres of our life. It has high impact index, increased deformation and thermal properties. It is suitable for exteriors and structural parts in cars, radio engineering and instrument making industries, commodities. Some of grades allowed to be processed by extrusion and has antistatic properties. Thermo- light- and atmospheric resistance with increased melt flow ratio. Some of grades allowed to be used for mechanical, internal parts of refrigerator, toys for kids, consumer goods with food contact. Following properties are also belongs to few grades of our ABS: high deformation, sanitary and hygienic properties with upgraded impact strength, for production of internal parts of deep freeze and refrigerators by pressure forming and vacuum molding; contact with food might be allowed with additional certification. Used to provide impact strength and heat resistance of the compositions of PVC alone or in mixture with other modifiers: chlorinated PE, acrylic modifiers, a methyl methacrylate butadiene styrene modifiers. The product is combined with rigid PVC and the additives for processing (waxes, fillers, lubricants, stabilizers, etc.) Has a stabilizing effect for the compositions of PVC. An additional feature is the stability of the mechanical properties of PVC profiles at low temperatures, improving the heat resistance. Self-extinguishing, contains a flame retardant. Intended for the manufacturing of blocks, insulation boards. The product is used for the production of thermal/sound insulation and packaging. 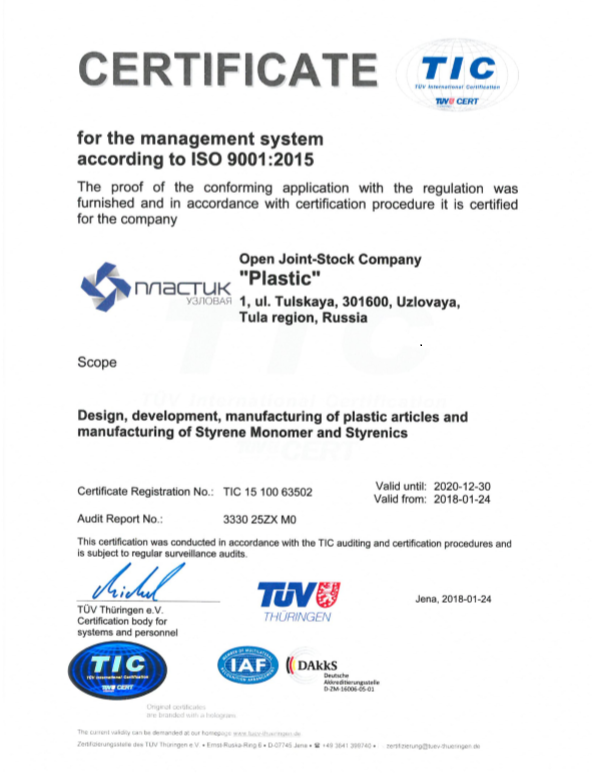 Factory’s sales policy provided by LLC Trading House «Plastic». Our experts will advise you on the purchase of a product and its specifications.